Todays post is going to be on how i cover up my acne, marks and redness. There are thousands of tutorials like this on the internet so you’re probably wondering why i thought this was even necessary. The reason i’m doing this is because the method i use to cover up my marks is much simpler than the majority of tutorials i’ve ever watched and read; also my main product i use here is one that i’ve never seen written or talked about yet it’s amazing so i wanted to tell people about that particular foundation which i love. Before we begin i’d like to mention you can get all these products from a drugstore or if you’re in the uk like me, boots or superdrug, It’s likely most of you haven’t heard of the foundation is use and thats because it’s a boots own brand but you can get this in the US. i know for sure no7 is stocked in walgreens because walgreens own boots and it is available at some target stores. 1) The first step is optional and it’s simply to apply primer to your entire face, i’m using the Rimmel lasting finish primer, it’s affordable and really great at making your makeup last longer as well. If you’re not one for primer skip to the second step, i would recommend it though. So the final step is to set your makeup, i use the rimmel stay matte powder in 001 translucent, my face stays matte for about 6 hours so i usually touch up about once a day which really is good going considering i have oily skin. i use a regular powder brush to apply it in stippling motions onto my face, the important thing when applying powder is not to sweep it across your face because you can end up moving the product. So thats it i think, my foundation routine containing no high end products or tiny concealing brushes with unrealistic application techniques. All in all it takes about 7 minutes to do because literally all that is involved is getting the product and bouncing it onto your face with a beauty blender or a RT complexion sponge. 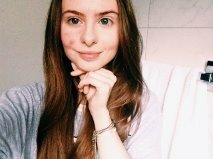 I really hope this is helpful to people with similar problems to me, it took a lot to upload pictures of what my face actually looks like on the internet but the feedback i’ve received from my last two posts has really encouraged me to do it. Thank you all so much, Maria.